Following the success of Raymond Blanc’s latest BBC2 series, Kew on a Plate, and accompanying book, we are delighted to announce that our St Albans and Farnham brasseries will be holding a very special dinner inspired by Kew on a Plate. The St Albans dinner will take place on the 19th May and Farnham on the 2nd June. Hosted by Raymond, guests will be taken on a mouthwatering journey showcasing the freshest seasonal ingredients from the sweetest asparagus to the zingy rhubard. At the end of the inspiring evening where you can glean tips from Raymond on how to make the most of this spring’s produce, you will take away your own signed copy of Kew on a Plate. The specially created three course menu features seasonal dishes from the book and you will be welcomed on arrival with a glass of our bespoke bubbly, Blanc de Blancs. 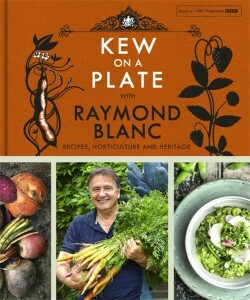 Places are just £50.00 per person including a glass of bubbly, three course meal and a signed copy of Kew on a Plate. For more information and to book your place at either brasserie, please contact your preferred location. Sea trout, pea puree, new potatoes, watercress sauce The peppery watercress sauce is perfectly paired with the freshest sea trout and new potatoes. Rhubard & Custard The simplicity of this dish’s name belies the various elements that it comprises. Rhubarb, the quintessential British fruit is the star of this dish and its zinginess is complimented by that other British favourite, smooth creamy custard.